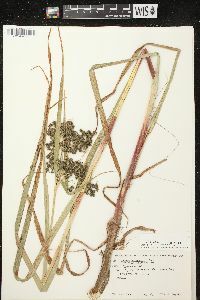 Plants spreading; rhizomes reddish, long, with conspicuous nodes and internodes. 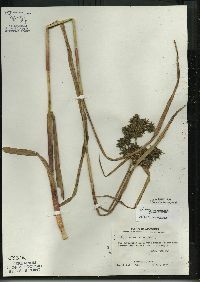 Culms: fertile ones upright or nearly so; nodes without axillary bulblets. 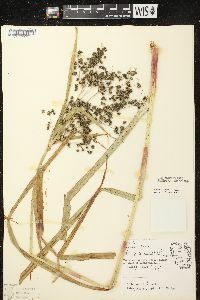 Leaves 4-11 per culm; sheaths of proximal leaves red; proximal sheaths and blades with septa few to many, conspicuous or inconspicuous; blades 23-60(-75) cm × 5-15(-20) mm. 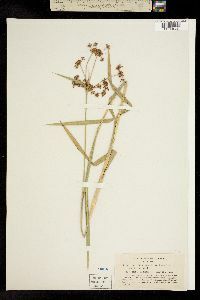 Inflorescences terminal; rays divaricate or ascending, proximal branches almost smooth, distal branches scabrous, rays without axillary bulblets; bases of involucral bracts green, black, or red, not glutinous. 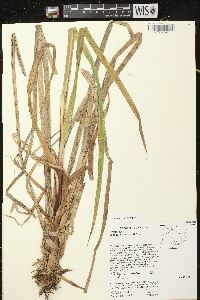 Spikelets in dense clusters of (1-)3-18 (largest cluster with 6 or more spikelets), spikelets sessile, 2-8 × 1-3.5 mm, ovoid or narrowly ovoid; scales green or black, broadly ovate or ovate to broadly elliptic or elliptic, 1.1-3.4 mm, apex rounded to acute or apiculate or occasionally mucronate, apiculus or mucro (if present) to 0.2 mm. Flowers: perianth bristles persistent, (3-)4(-6) per flower, stout, straight or curved, shorter than to 1.5 times as long as achene, with retrorse, thick-walled, sharp-pointed teeth densely arranged almost to base, enclosed within (occasionally weakly projecting from) scales; styles 2(-3)-fid. Achenes almost white, ovate to obovate in outline, biconvex to plano-convex, 0.7-1.6 × 0.8-1 mm. 2n = 64, 66. Fruiting early summer (Jun-Jul). 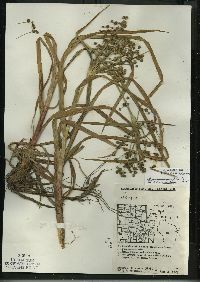 Marshes, moist meadows, ditches; 0-2900 m; St. Pierre and Miquelon; Alta., B.C., Man., N.B., Nfld. and Labr., N.W.T., N.S., Ont., P.E.I., Que., Sask., Yukon; Alaska, Ariz., Calif., Colo., Conn., Idaho, Ill., Ky., Maine, Mass., Mich., Minn., Mont., Nebr., Nev., N.H., N.J., N.Mex., N.Y., N.Dak., Oreg., Pa., R.I., S.Dak., Utah, Vt., Wash., W.Va., Wis., Wyo. ; Mexico (Baja California); e Asia (Kamchatka Peninsula). 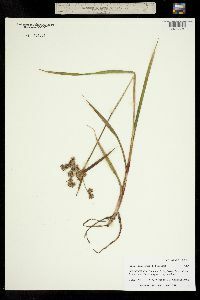 Scirpus microcarpus occasionally hybridizes with S. expansus, particularly in New England. 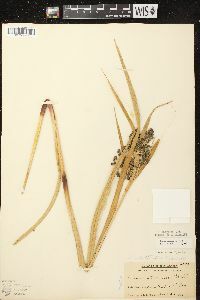 Populations of Scirpus microcarpus from eastern United States have been treated as a distinct species, S. rubrotinctus Fernald. 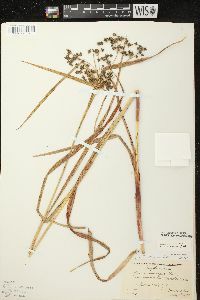 Populations from the central part of the continent are intermediate for the characters Fernald used to separate S. rubrotinctus. The taxonomy of the group should be reinvestigated. Populations from the Queen Charlotte Islands (British Columbia) have a different chromosome number (2n = 64; R. L. Taylor and G. A. Mulligan 1968) than populations from New York and Pennsylvania (2n = 66; A. E. Schuyler 1967, 1976). 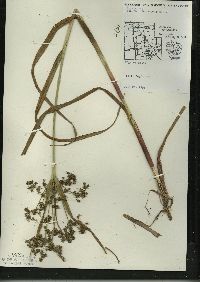 Perennial herb with long, reddish rhizomes, spreading 0.6 - 1.5 m tall Leaves: three-ranked, four to eleven per culm. 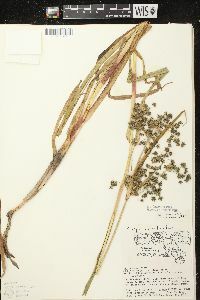 Sheaths of lower leaves reddish. 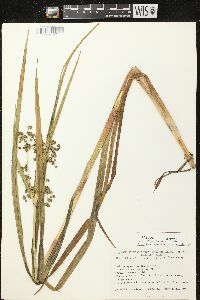 Blades 20 cm - 0.6 m long, 5 - 15 mm wide, flat, grass-like, keeled beneath. 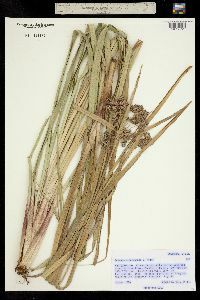 Inflorescence: a large arrangement of spikelet clusters, terminal, many-branched with numerous ascending or diverging stalks, subtended by three leaf-like bracts. 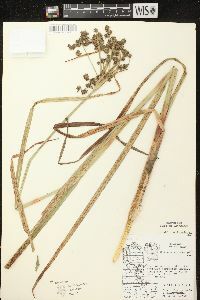 Bracts green, black, or reddish basally, unequal, the longest 10 - 30 cm long. 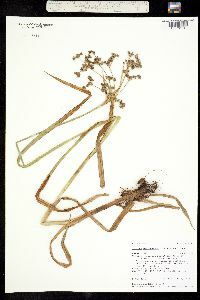 Flowers: minute, subtended by a floral scale, lacking sepals and petals, bearing three to six (usually four) persistent bristles. 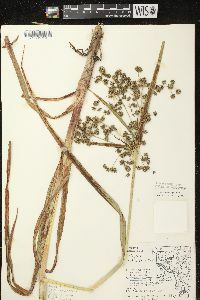 Bristles stout, slender, curved or straight, shorter than to one and a half times as long as achene, bearing many small sharp teeth, enclosed inside the scales. Stamens one to three, exserted. Pistil one. Style linear, two-cleft (or some three-cleft), base persistent. Fruit: a one-seeded achene, nearly white, 0.5 - 1.5 mm long, about 1 mm wide, egg-shaped to reverse egg-shaped, biconvex or plano-convex (flat on one side and convex on the other), minutely bumpy. 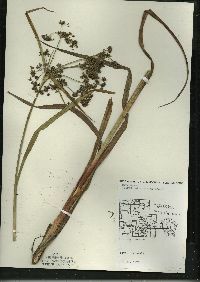 Culm: 0.6 - 1.5 m long, three-sided, solid. 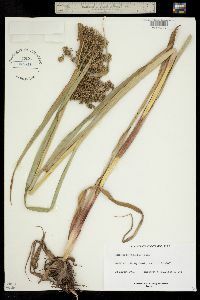 Spikelets: in dense clusters of three to eighteen, stalkless, 2 - 8 mm long, 1 - 3.5 mm wide, narrowly egg-shaped to egg-shaped. Floral scales spirally arranged, green or blackish, 1 - 3.5 mm long, egg-shaped or widely egg-shaped to elliptic to widely elliptic with a pointed or rounded apex that sometimes bears a tiny point. 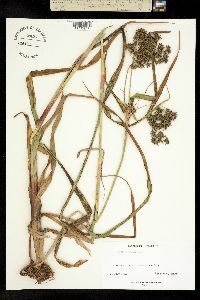 Habitat and ecology: Rare in the Chicago Region, and known only from Lake County, Illinois, where it grows in marshy ground. 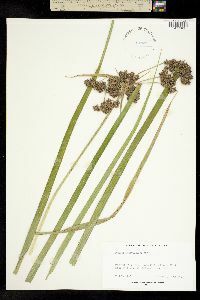 Etymology: Scirpus comes from the Latin name for a bulrush. Microcarpus comes from the words micro, meaning small, and carpos, meaning "fruit."